Overflowing with wildflowers in the Spring and Summer seasons and offering great views of Fall colors in October, this hiking area offers a variety of adventures in the Great Smoky Mountains National Park. Family friendly exploring can be done in the meadow around the Science Education Center that sits at 4840′ with Purchase Knob just off to the southwest. 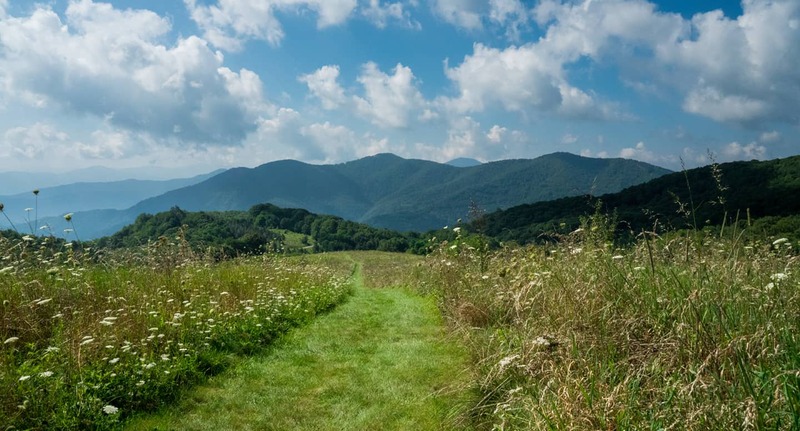 The meadow gives views of Cold Mountain, Mt Pisgah, Crabtree Mountain, Newfound Mountain, and Mt Sterling. In addition to Purchase Knob, other trails lead to the John Ferguson Cabin, Cataloochee Divide Trail , and The Swag. If you want an all day adventure hike the Cataloochee Divide trail and then stop by downtown Waynesville after for a fresh meal and maybe even a cold brew! Make a stop by our Visitor Center in Maggie Valley and pick up a Purchase Knob Hiking Map or download it here. 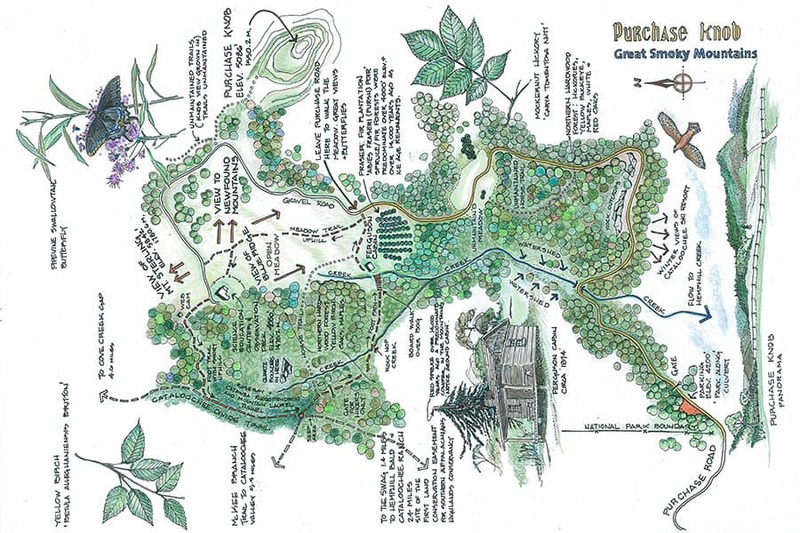 This beautifully illustrated map was created by a local certified naturalist and highlights one of Haywood County’s best hiking gems. Kid Friendly when the Purchase Road gate is open, you can drive to the top of the road to explore without needing to hike very far to Ferguson Cabin down below. Actual trail to Purchase knob summit is not maintained and the view from the knob may be slightly overgrown. In winter the gates to the top of Purchase Road close but you can park at the gate and hike. 5 mile Loop – Parked outside of the National Park gate walk up Purchase Road to follow signage for Ferguson Cabin then continue uphill. Take a right through the meadow (clear but unmarked) to lead you up to the Science Learning Center. Continue to the rear of the Center following signage for Cataloochee Divide Trail and follow it left. At the Swag Resort fork turn left on McKee Branch and take the the pathway “for hikers only” to Ferguson Cabin. Walking past Ferguson there will be a trail to the right leading back to the bottom of the meadow and a left on Purchase Road will return you to the start. From Waynesville take 276 N. Turn left onto US 19 towards Maggie Valley. Right on 276 N towards I 40. Left onto Hemphill Road which becomes Purchase Road. Feature Photo courtesy of Solitary Photo Traveler.